We were fortunate enough to join a compelling and entertaining lecture last week by Michael Marriott (MM) the designer. Michael has trained with both a technical and art school background as a Royal College of Art graduate. His thinking and philosophy comes from furniture design although he works in other areas covering product and curatorial design, but his love and passion for furniture is the core of his practice. His lecture was entitled ‘Michael Marriott shows you some stools’, we thought that we would share our reflections of the day with you and highlight some of the intriguing references and anecdotes that Michael brought to our attention. 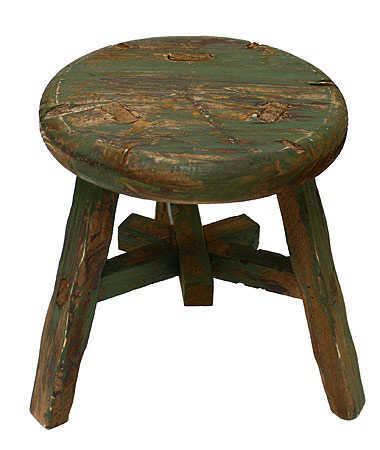 Taking this basic stool archetype, it brings back early memories for MM of working to make simple furniture with his grandfather as a child. In addition to being a designer he is now also a collector of furniture and brings attention to the Singer sewing machine stool, expressing an interest in where things come from, the context of objects, both geographically and technologically. 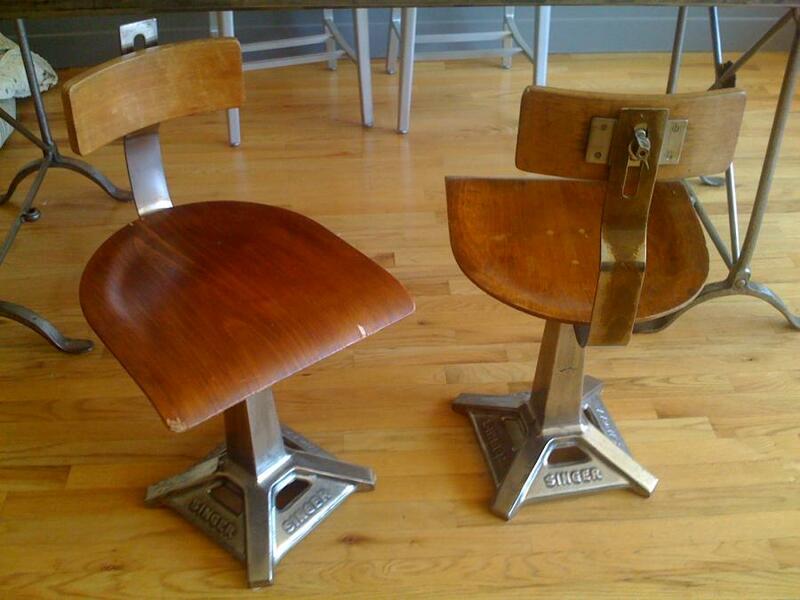 The Singer sewing machine stool being a good example of an object that is overlooked in the history of design, due to it being engineered, created by an apparently anonymous individual who is not a ‘designer’ in the conventional sense and whose engineering concerns were purely based on the economy of the idea. 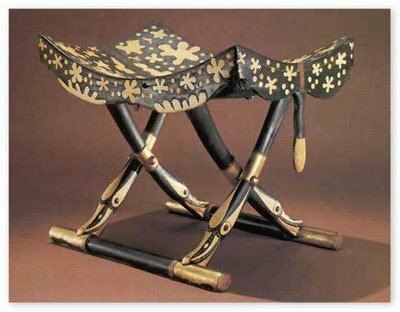 MM in his lecture focused on an X frame stool from the Tutunkharmun Exhibition at the British Museum rediscovered in the 1970’s. At around 5000 years old he comments that it is remarkable that, firstly it is still around, but also in its refinement, as we have not advanced beyond this point in 5 millenia. The basic technology of woodworking that evolved in Egypt was based on ingenuity and efficiency as there was little timber available, with most sourced from what washed upon beaches. Marriott notes that in Europe it was not until Georgian times that we reach this level of refinement with the character of grace and utility being achieved through the use of thin sections of material. By contrast he later makes reference to the African stool stating that they are quite clumsy, with no real plan or structural understanding in their construction, being hewn from a single piece of timber, requiring huge amounts of work to achieve the suggestion of being made out of individual components. Inspired by these Ashanti stools and their mass of carved timber, he cleverly maintains his trademark theme of using honest materials by creating the carved wooden Sunsum stool from a solid block produced by digital manufacture, being milled from solid stacks of walnut. 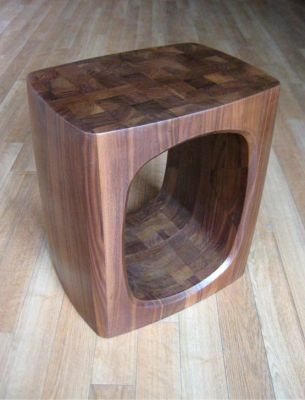 He also made mention to a simple milking stool constructed of forest wood and offcuts in the most low tech of fashion, relating that the fact that it is put together in whatever way makes sense with little attempt to make it look nice, but rather simply and honestly responding to the material. MM cites as his ‘design hero’ and major influence Max Bill, founder the Ulm School of Design – a design school initially created in the tradition of the Bauhaus and which later developed a new design education approach integrating art and science. 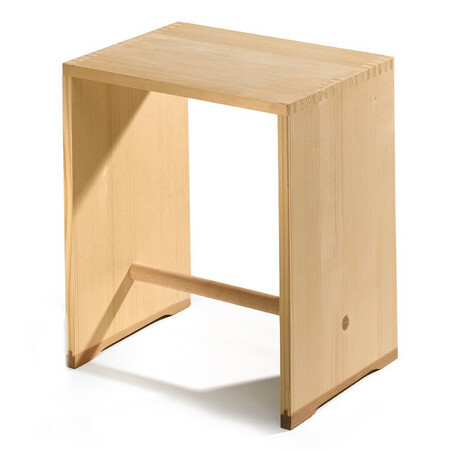 Among Bill’s most notable product designs is the “Ulmer Hocker” of 1954, a stool that can also be used as a shelf element or a side table characterized by a truthful and honest clarity of design, important attributes that MM has kept returning to as a reference in his work. Of influential designers, he names Achille Castiglioni as an important figure, who he contends is the Marcel Duchamp of the design world. Talking about ‘Readymades’, he upholds Castiglioni’s Sella bicycle seat stool (1957) as a significant piece of design emblematic of the emerging Italian furniture design industry after WWII. 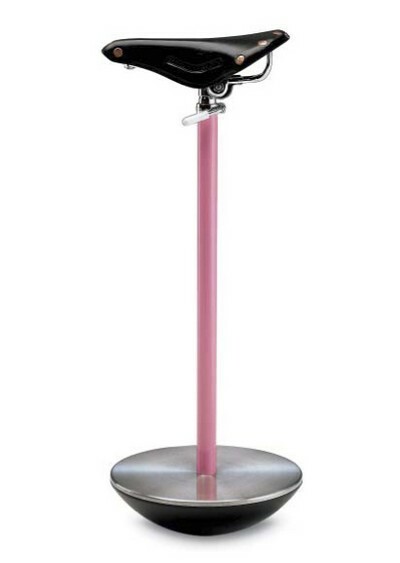 The Sella stool that he designed from a bicycle seat pivoted on a tubular stem and a cast iron base, was inspired by Castiglioni’s longing for a more comfortable form of seating from which to make calls from a telephone, when he liked “to move around” and “to sit, but not completely”. MM commented that he reflects on all these 5000 years of knowledge of furniture through ‘making things out of found things’. His brilliantly functional work leans toward the enormous potential of a ready made – their uses, misuses, function and dysfunction as originals and within his own designs. Marriott’s love of the utilitarian end of the palette of material and honesty of construction is highlighted by his recurrent use of raw ply, card and aluminium. 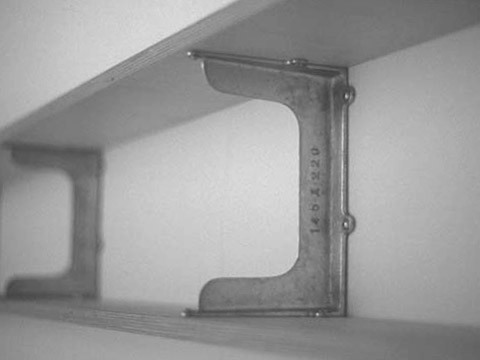 His Cast aluminium double sided Shelf bracket, accommodating two shelves is an object that embraces these ideals conceptually. Returning back to his collection of furniture MM shows an example of a Thonet Bentwood Chair that he argues is the World’s best chair that cannot be improved upon. 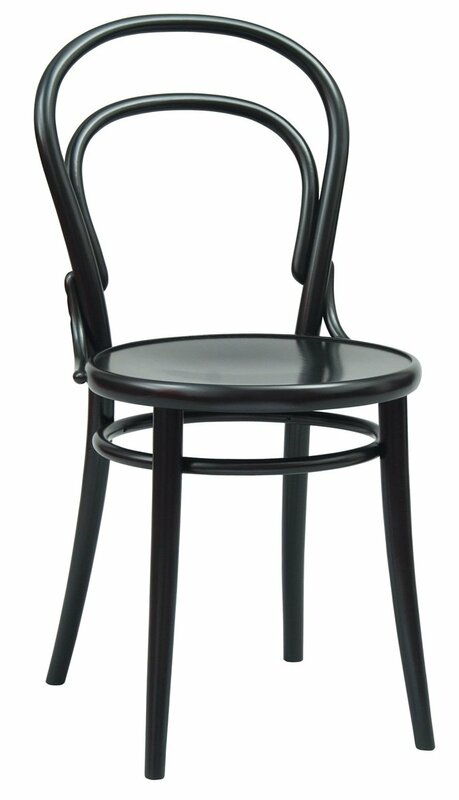 The character of this chair is provided by the use of green timber, as the material can bend easily under certain conditions during production. The design of the bentwood chair, particularly the No.14, the archetype of greatest fame is due consideration for its honesty in construction and manufacture. MM upholds the entrepreneurship of Thonet, believing that he was ahead of his time; what with his factory built in a forest in order to source his material locally, the stackable nature of his chairs that enable 36 to be stored in a 1 square metre cube, allowing for efficient transportation and the durability of the chairs themselves having a pleasing flexibility that ensures that they flex rather than break under the strains of continued use. Concerning directly the decrepit bentwood chair portrayed in the lecture MM raises our attention to an ad-hoc repair carried out with fine thread wrapped around a broken scarf joint on the footrest stretcher rail of the chair. He highlights that the repair is self-evident and points towards the honesty of fixing things. He makes the case that the work of an antique dealer who makes use of his tools to fix up the old to ‘make perfect’ is fundamentally untruthful and misleading, as in the workshop you can see the repair and but the patina of the French Polish and the false aging practice commonly employed of striking the piece of furniture with bunches of keys of chains only goes to disguise the underlying craft. MM returns to the importance of the honesty of appearance in his own work discussing to an edition of 100 birch plywood stools he designed for Paul Smith. 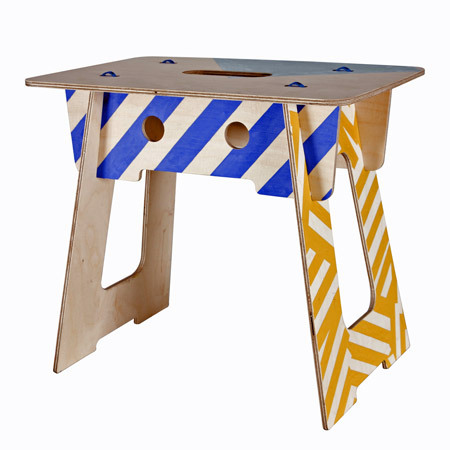 Screen printed with a selection of five specially designed prints in eight colours, and assembled with one of eleven different coloured zip ties, a geometric screen print is hand-applied to each of the plywood sheets from which the stool components are cut. The printing technique is crude, producing accidental and imperfect results that are also delightful. MM has also completed a number of specially commissioned installations, which typically use a gallery environment to exhibit and discuss issues to do with the design and production of things. Marriott explained that he is occasionally asked to engage in a curatorial role in the design of exhibitions and he emphasized his struggle to reconcile with these collections of objects and how to deal with a gallery as a designer. 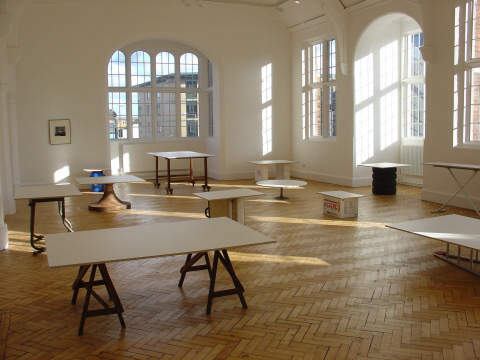 Citing his work, ‘Economy of Means’ at the Camden Arts Centre he contemplates that ordinarily plinths are supposed to be anonymous, a way to support the composition of things. As a designer he has reconciled with the conventions of the gallery to suppose that surfaces with nothing on requires the supports to become important and convey issues surrounding design. Again taking inspiration from Castiglioni he references the Leonardo Trestle, becoming intrigued by how the trestle is somehow not taken as seriously as a four legged table due to the context of their typical use in ad-hoc utilitarian situations. “This project has become like an odd investigation exercise, to the extent that even writing this now, the final outcome is still not completely resolved. It started off by looking at the web site of FRAC Nord, a regional art collection based in Dunkirque, looking for pieces from their art and design collection that I could make a show with, possibly also mixed with pieces from other places? The piece that triggered the line of investigation was by French photographer, Robert Doisneau, entitled “Les coulonneaux de l’alle droite” (1951), which translates as “The pigeon fanciers of the right aisle.” I found it a very intriguing image, with the painting of the same setting, some years earlier, serving as the backdrop to the photograph, meaning both it’s foreground and background were occupied by two very similar trestle tables. 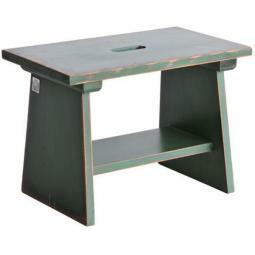 Trestle tables have always fascinated me, they are kind of seen as the underdog, next to a regular table. 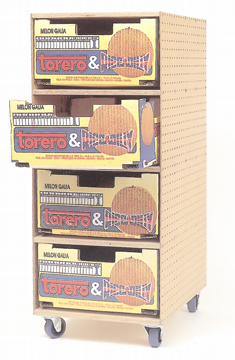 They are often viewed as something, workaday, not worthy of use indoors. They have a humbleness, a lack of pretension. They are utilitarian and proud of it, they are comfortable, convenient, stout, fast and useful. 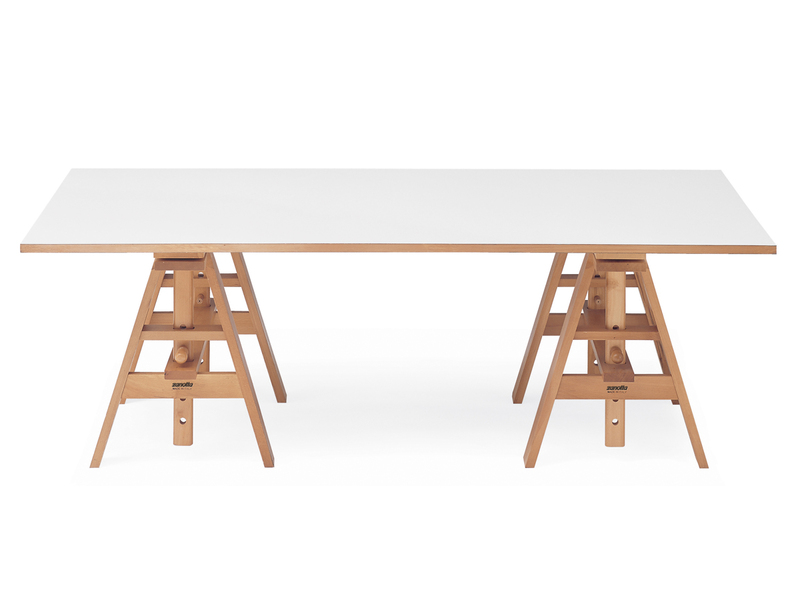 There could be something in using trestle table’s to illustrate certain issues about design. They might work really well combined with some pieces from the FRAC collection? This fascinating photograph has a very similar setting to Leonardo Da Vinci’s painting, ‘The Last Supper’; both consist of a group of men gathered around a long trestle table, with one long side open to the viewer. There are obviously some real differences as well, not least the ten pigeon fanciers as opposed to Jesus and his twelve disciples. ‘The Last Supper’ was painted on the refectory wall of the monastery of Santa Maria Delle Grazie in Milan between 1495’. Marriott indicates that he has also completed a number of specially commissioned installations including a rotationally moulded stacking plastic stool for the Southbank Centre in London. This design is purely based on his observation, that much of our street furniture is repurposed by passersby as seats or a perch. 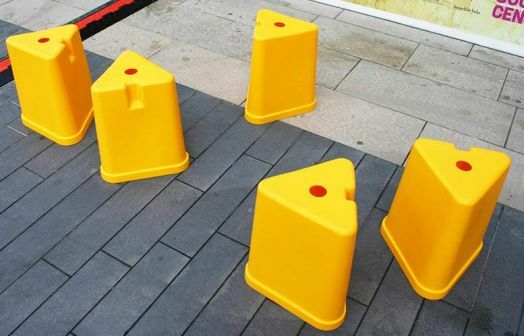 This Rotostacker stool is configured to appear similar to a traffic cone of bollard, in order to direct you or to tell you where to go, but additionally can be sat upon to take a rest momentarily. 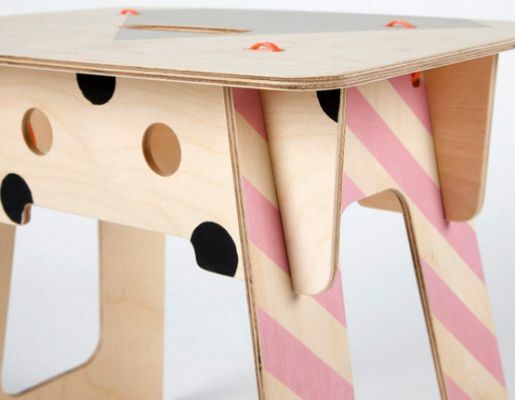 The stool design for the Southbank centre was intended to comment on reclaiming the land that surrounds the site for the public and to celebrate it’s scale. 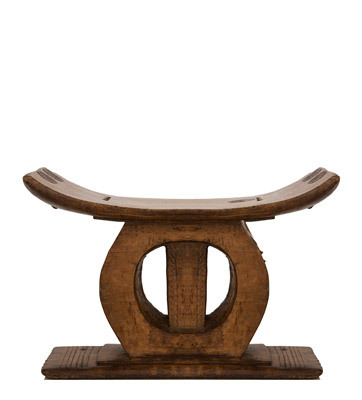 How can I purchase one of Michael Marriott’s African Stools that I saw on your website under the heading “Michael Marriott Shows some Stools”. My name is Richard Orselli and my cell # is 310-367-2422. Thank you.